Start a new project at https://builder.daypilot.org. The preview Scheduler instance is updated in real time. It also supports drag and drop operations (event creating, moving, deleting) so you can test the functionality. This will start a download of a zip file that includes a HTML5 page with the Scheduler, initialized using the selected options, and a trial version of DayPilot Pro library. The available range options only cover common scenarios. You can use custom values if the pre-built options don't meet your needs. This property also configures the Scheduler grid scale (cell duration) to match the time headers. "format": "dddd, d MMMM yyyy"
By default, it displays the full timeline (including non-business hours). 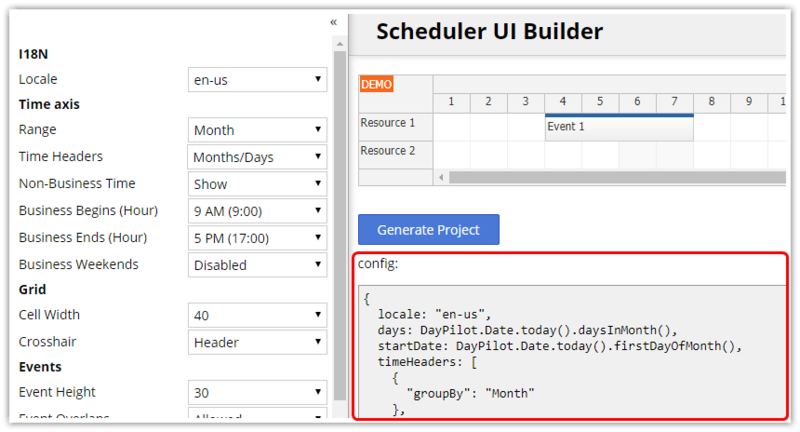 The UI Builder lets you configure the Scheduler to only display business hours. The business hours are defined using a hours of day (business begins -> business ends) and days of week. The hour range only applies when the grid scale is smaller than 1 day. The Scheduler also supports programmatic customization of the timeline - if the combination of business hours options doesn't work for a specific use case you can hide selected time cells using onIncludeTimeCell event handler or create the timeline manually (by defining individual cells). The "Auto" option activates auto cell width mode where the Scheduler calculates the cell width automatically to fill the available space (this option prevents the horizontal scrollbar from appearing). In a typical web application you'll want to load the resources and events from the server side using REST API. The Scheduler includes a helper methods for loading resources and events in JSON format.